While Arjun has already carved a niche for himself, Mubarakan happens to be Athiya's second big screen outing post Hero. The makers recently teased the first look of the two from the film as Charan and Binkle and got the fans' curiosity piqued. "Hello & satsriakaal from Charan & Binkle !!! 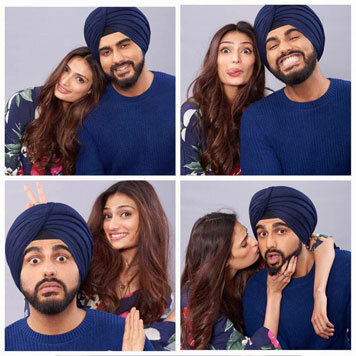 #Mubarakan #candid #photobooth @athiyashetty #sonypictureproduction @SnehaRajani @ashwinvarde @MuradKhetani @abazmee @ballijanjua Photographed by @avigowariker," Arjun wrote while sharing the look on his official Instagram account. The four photographs in the collage give a glimpse of the camaraderie the two share with each other - both onscreen and offscreen. From quirky poses to the mushy ones - their chemistry is something to look forward to apart from the quirks, antics and other fun elements the film's first look promises to offer. Directed by Aneez Bazmee, the film will feature Arjun in a double role. Mubarakan also stars Ileana D'Cruz in a key role.